For much of my life, I’ve been waiting. Waiting to graduate from high school so I could go to college. Waiting to get through college so I could get married. Waiting to save a little money so we could have children. Waiting for the children to grow up so I could write. Waiting to invest in my marriage until we had more time. There’s been a whole lot of waiting for some unseen day on the calendar, a day when all the stars would align and I’d finally be able to be the person I wanted to be and to create the life that I dreamed. Problem is, life kept interrupting my plans. Sometimes, it was ordinary life. Like commitments and calendars and responsibilities and relationships. Like a steel ball in a pinball machine, I bounced from circumstance to circumstance trying to land the most points in the process. Problem was it all seemed random and reactive. Not intentional. I lived at the whim of each day’s events. Then, on a Tuesday morning before Thanksgiving 2010, a doctor’s phone call changed everything with the word “cancer.” Then, eight months later on a Wednesday morning, another phone call came with the addition of three small children to our already full lives. If I thought life was a bit off course before, it was fully off the rails by then. Let’s just say the pinball machine was practically in flames. The details of your story are likely quite different than mine. But you know what it’s like to end up with a life that doesn’t look quite like you dreamed. Sometimes it’s the result of traumatic, uncontrollable circumstances. The unthinkable happens and overturns everything. But, more often than not, it’s the ordinary, everyday interruptions and busyness and apathy that leads us to a life we didn’t really want. Yesterday can’t be changed. Regret is a ruthless prison warden, and I’ve talked to far too many men and women who are chained up by him. When life doesn’t turn out as expected, it’s easy to obsess over all the things we should’ve, could’ve done differently. The problem is, no amount of wishing will change anything that’s already happened. None. It’s done and over. Tomorrow isn’t guaranteed. I’ve learned this lesson the hard way, with three cancer diagnoses that wouldn’t go away no matter how hard I tried. The upside of all that personal hardship is this: I now have no illusions about the number of my days. I could live to be eighty or I might not make it to my next birthday. God only knows. Tomorrow is not promised. Not to any of us. Today can be lived. If we can do nothing to alter our past and zero to guarantee our tomorrows, then all we’re left with is today. And guess what? Today is enough. And the best thing we can do with today is to craft it and live it well. A proven method for putting your priorities in place. A new (and do-able) approach to work-life balance. This isn’t brain surgery. It’s a book. And for under $15 you can get a solid resource that can help you make the most of the life you have right now, regardless of what’s happened in the past or may be up ahead. At the least, know this: You can’t wait to craft your life. Time isn’t forever. You have today. But today is enough. Live it well. [callout]GIVEAWAY! 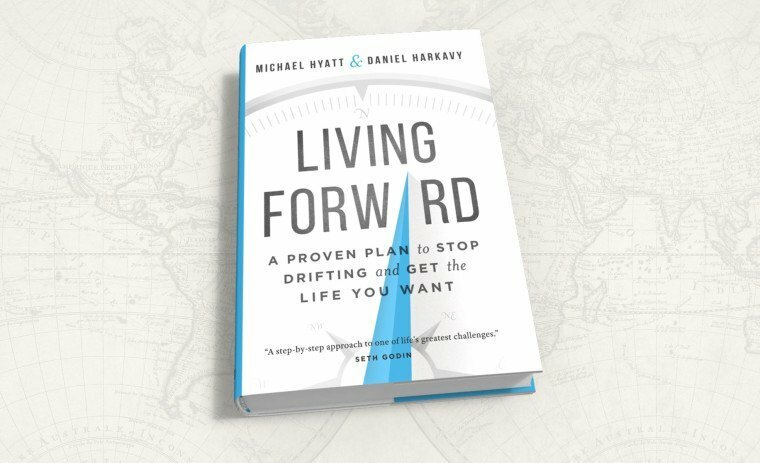 Today I’m giving away FIVE COPIES of Living Forward: A Proven Plan to Stop Drifting and Get the Life You Want. To be entered for the giveaway, complete the following: (1) Answer the question below in the blog comments, and (2) Share a link to this post on Twitter, Facebook and/or Instagram. Be sure to tag me so I see it! Winners will be announced here by Friday, March 4, 2016. On a scale of 1 to 10 (1 being “100% reactive” and 10 being “100% proactive”), how intentional are you about your life? How could Living Forward help you to stop drifting and start crafting the life you want? I’m a 7 . Living Forward could bring greater focus and help with the need to stop drifting back! I feel I am a 3. I strive to be more proactive in my life but the fear of what might happen, the fear of rejection, and the uncertainity keep me from being proactive and standing up for what I know needs to happen or take place. I want to learn how to live forward and not be afraid. I have the desire to learn and make it happen I just don’t know how and this new book would definitely teach me that. It is amazing to me that this is your post today, as this thought has been on my heart lately. I would say that I am at a 4. I think I know which direction to go, there are just too many distractions on the path to get there. I am about a 6. I slightly lean toward being proactive overall, in individual circumstances my proactively depends on how comfortable and not fearful I am about that situation and how to move forward. If I am fearful I try to avoid the topic or hide from the problems. I need this book to help me make a strategy for moving forward with my dreams and purpose from God despite all the tragedy, setbacks, and heart break I have experienced. “Yesterday can’t be changed, tomorrow isn’t guaranteed and today can be lived.” Such wise words Michele. I need to remember this each and every day. Would love to win a copy of Michael’s book. I think I am a 1 or 2. I took an early retirement and am just unsure where I am and what God wants next in my life. I need some help finding a new direction and purpose. I shared the link on Facebook but do not know how to tag Michelle. I would say that I am around a 6. I am a planner and love to plan ahead. Unfortunately, we have had a great deal of reactionary situations in our lives in the past 5 years which have put my own plans on hold. Love listening to you with Michael, Michele! Thank you for the blessing and inspiration that you are!! Goodness…. I so desperately want to say I am a 10! Sadly, though I would rate myself a 2 right now. I have been eyeing this book too…. I need the wisdom that is packed in this book along with God’s Word to stop my drifting that is for sure! I believe this book will help me because it will be a fantastic tool of encouragement and motivation as well as guidance. Very excited about what God wants me to do for him but so easily distracted. I see something that is out of place, I’m hungry, need to run to the mail box, I am going to answer just one more text or check my email one last time, oh now the whole day is gone and yhe kids are home and me well I’ve accomplished nothing. God wants me not to waste my time on earth and I dont want to let him down. At 42 years of age I havr learned a lot of lessons but haven’t done anything productive with the lessons learned. I need to be more obediant with staying on task, God has work for me to do! Life is what happens when I’m making other plans! I’d say I’m probably a 3. I like to plan for the future…and try to envision a way to deal with each possible contingency. The the real thing happens and I just adjust everything! So…I’m thinking I REact! I would say a 3. I love to be proactive but I let life get in the way too many times and wind up being more reactive than proactive. Living Forward would help give me the tools that I often find to be overwhelming as to where to start, how to start and giving up the control and letting God steer my course. Hi Michele. I’m somewhere in the middle of your scale. I know the importance and have the desire to be intentional, but I just can’t seem to get there in all areas. By God’s grace and with the help of Michael’s and Daniel’s book I hope to live more well (forgive the tortured grammar). Thanks for the offer! Blessings. On the proverbial scale I am about a 6 and I know I can aspire to higher. I was nearly in tears watching the LIVING FORWARD livestream event last night as I believe this solid, practical tool is a direct answer to my prayers in seeking the life I desire! Cannot wait to ” dig in ” and get going! I rate myself at 7-8. I have learned in the past five years how to live intentionally. Before that, I survived, reacted and drifted. I am still working on focused effort and prioritizing what really matters most. Helping others through this process is the next step in my professional path. I will get to do this for a living! Guide others in their journey of discovering how to fulfill God’s purpose for their life. It doesn’t get more exciting than this! I agreed with what Michael and Daniel said about this content being offered in high school and college. I sure could have used it then! I am more reactive than proactive. I think I am in somewhere in the middle on the scale so a 4. I am more like a 6. I have been trying to improve that these last couple of weeks. Hmmm. Is it possible to get a negative on this scale??? Right now so many (so. very. many.) things are just “happening TO me”. Even though it would generally have “seemed” that I am intentional and a planner…. Today is another day when I feel like I boarded the flight for Hawaii and landed in Norway! (nothing against Norway —but you’d probably pack different). Just came over after listening to your podcast for hours this morning. Really glad I found the podcast and this site. Thanks! I would say 5, plus or minus 5 🙂 We just celebrated our 1-year-old’s birthday, and shortly before that found our we are expecting another one. On one hand, I want to cherish the fleeting moments as of a family of three. But on the other hand I catch myself saying “Life will begin after the next baby.” I said the same thing after college, after getting married, after my CPA exams – yet nothing really changes. This book would help me take “knowing” and turn it into “doing”. I’m probably a 6. I try to be proactive, but somehow life always throws me a curve ball so that I’m more reactive than I would prefer. I think I would sit at about a 6 right now. My life seems to be all a mess (like laundry scattered every where) 😉 I feel like this book could give me the structure and plan I need to get my life back on track. I’d say I’m at about 70% proactive and 30% reactive. I have been working on this whole notion of life planning for awhile now and I’m excited to read this book and finish up my plan. I got detailed by cancer and some business changes and I really want my path to be clearer so that when stuff happens I can remind myself where I’m going and get back on track. I believe I’m an 8 on the intentional scale. I know that I want to use my writing to glorify God. I work on my writing/apron/cooking business everyday. However, as much as I try I keep getting either closed doors (finding an agent) or no traction (advertising my indie-published books doesn’t result in increased sales). So I’m doing the work, but not seeing results. Very frustrating. I would have to say that I am about 65% Proactive. I have four small children, many health issues myself and my husband had cancer 5 years ago and a few months ago we had a scare and he had to have surgery again. I home school my kids and my day if very full. I have plans in my head, plans I have had which seems like forever. I sometimes think that it’s okay. The family needs me first. I have a hard time taking time for me. And then sometimes I feel like I am falling apart because I know how fragile life is and that every day on earth is a gift from God. Sometimes I feel burnt out and scared because those dreams and ambitions that are in my head seem like they are getting further and further away. They are important to who I am but sometimes I am not sure who that is. I hope your book could help light a path where it has been a little dark for me. Maybe it will help me to find myself again. Thank you for your time and God Bless. I am probably less reactive than I was 10 years ago, however I still struggle with “throwing my hands in the air like I just don’t care” when things go wrong… Or the unexpected happens. I become so overwhelmed I forget to look for what it is God is doing. So I would say I am probably still 75% reactive. I’ll be 50 this year and my last child graduates from high school. I am a 1, I plan little and fly by the seat of pants. I’ve had a happy life but would love to be a little more proactive in the way I do life, if for no ther reason, more peace! So very well said Michele! It was wonderful meeting you last week! Thanks for sharing! I am a 2 to 3. I am looking forward to learn ways to become a 1…all the time. Not just whenever it is convenient. I want to be able to handle any situation that comes my way without reacting to the extenuating circumstances. Thanks for this post, Michele. I am so grateful for your support on this important project. You are a true friend! When I was younger I was probably an 8. Once becoming a mom, I feel like I have no control over anything. I try to plan things out, but they never go as planned. So, in a lot of ways I have given up on trying to plan. I am probably now a 3! Would love to get closer to that 8 again, but I want God to be the one in control this time and not me. Regrettably, I am hovering around a 3. I did watch the free videos which accompany the book and I to the test to determine which areas of my life need for passion and/or purpose. Now, I just need the book to put all the findings to work. Btw, I love how you wrote this post. It is so relate-able, even though our circumstances are very different. Thanks for doing this giveaway! I would have to say that I have been living in the 5 zone…very vanilla. I am in a transition stage in so many areas of my life, moving for the third time in a less than 2 years to support my husbands career opportunities, as a result, my personal “career” is non existent. Perhaps an opportunity to take a few passions and desires off of the back burner and yet, I feel very timid at the process of doing so and I struggle with fear and vulnerability and intimidation. I would love to dive into the structure of this book that would help me to press forward. Did I mention that I don’t want to be vanilla?!?! I’m a 6. We are super proactive in our finances and I practice being proactive at my day job and planning out my days, but my immediate thoughts are reactive thoughts and I almost immediately think worst-case scenario. LIVING FORWARD would help me because it would help me be more intentional with every aspect of my life and not just one or two. I want to be proud of every day and put in the work necessary to achieve my dreams. I would say I am at a six and would love to get more proactive with my life!! Thank you so much!!! A huge blessing! Although different events, your life sounds like mine. Life also hit me with unexpected. I witnessed my mom being murdered when I was 15 and more. Also went they years of depression that kept me in bed. I am completely new to blogging (and totally learning) only a couple months writing, but you are welcome to read my blog on overcoming depression at Lorettasmail.com. I am also new to you and Michael Hyatt… I am in a new journey . I am enjoying learning from you. I. appreciate your feedback. Blessings Michele ! Although different events, your life sounds like mine. Life also hit me with unexpected. I witnessed my mom being murdered when I was 15 and other traumatic events. In my case I fell into years of depression that kept me in bed. I am completely new to blogging (and totally learning) only a couple months writing. Everything I have heard and learned from you and Michael Hyatt has been so valuable to me. Thank you! “Today can be lived” so much wisdom into this sentence. It’s so right, so real.